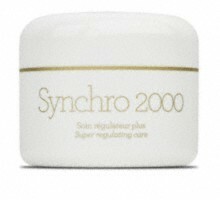 If you prefer to wear a lighter-texture cream in the morning then you may wish to use Synchro 2000. Its texture is smoother and less oily that the Synchro cream. Its active ingredients are, however, identical, making this an excellent moisturising cream recommended for all skin types. Synchro 2000 is rejuvenating and healing. It regulates the skin functions and its defence mechanisms. Synchro 2000 is anti-pollution and it helps to fight free radicals.